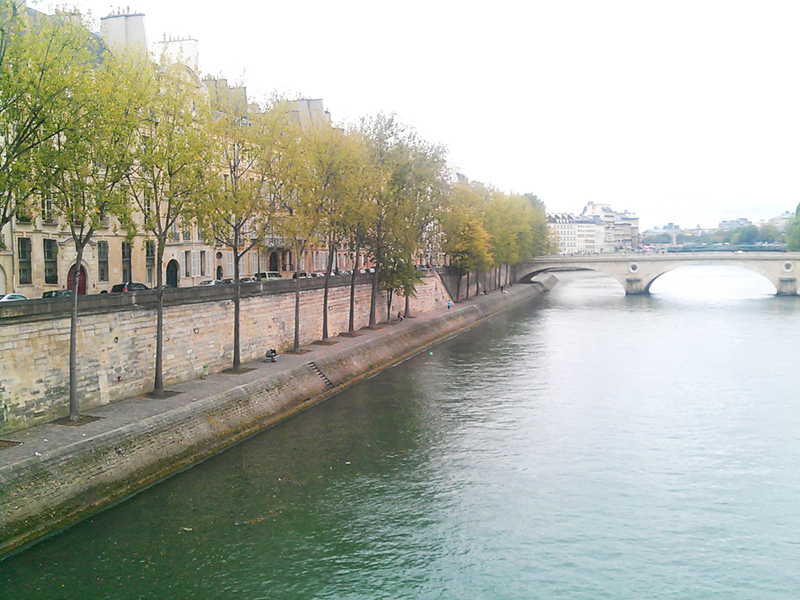 Here's a route that fits a lot of Paris flair into one scenic loop around the Seine. 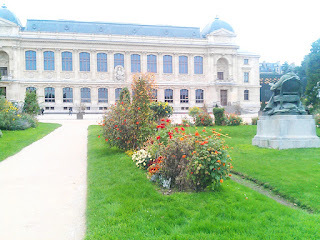 It starts in the heart of Paris, on the Cite island at Notre Dame, then heads across the old island of St. Louis, before heading north to the ancient neighborhood called the Marais, also known as St. Paul. 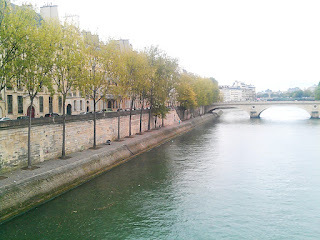 It then heads south, crossing the river again the other way to loop through the botanical garden and zoo, and finally returning directly along the beautiful Seine again. There are a lot of interesting sights here, and more parkland and water than you'll find in most parts of Paris. Sound interesting to you? Well, let's get going! To get to the starting point, you can take several Metro lines or the regional trains (RER) to either the Citè station or St. Michel. 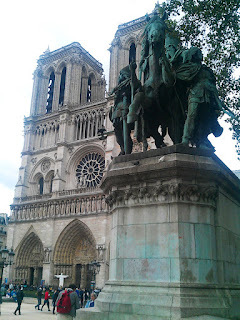 Find your way to Parvis Notre Dame, the square in front of Notre Dame cathedral, and take a moment to breathe-in the atmosphere, at least as good as it goes with all those tourists swarming about and stepping on your new running shoes. So now, it's time to get moving. Turn to face the cathedral, then run toward its right side. You'll see a gate going into the narrow park beside it. NOTE: If you're running this at night, the park will be closed, and you'll have to run along the Seine River to your right side. 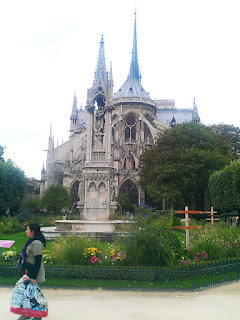 Run southeastwards through the park with the cathedral to your left, with its amazing flying buttresses flanking its roof-line and Quasimodo peering down at you from the tower. Follow the park as it curves to the left behind the church. Exit the park at the northeast corner and you'll head directly over a pedestrian bridge, Pont St. Louis, to the island of St. Louis. This will lead you directly into the main street on the island, Rue St Louis en l'Isle, where you continue running eastwards. This old street is now lined with exclusive boutiques, hotels and restaurants, as the whole island has been gentrified, catering to rich tourists. No matter, the shops are amazing, as are the old buildings that they are located in, with their timbered ceilings. After three blocks you will reach the main cross-street, Rue des Deux Ponts. Turn left here and cross the Pont Marie bridge northwards to St. Paul, one of Paris' oldest neighborhoods. But don't worry, we'll come back to see more of St. Louis later. The whole St. Paul area is a maze of interesting old streets with hidden gems. 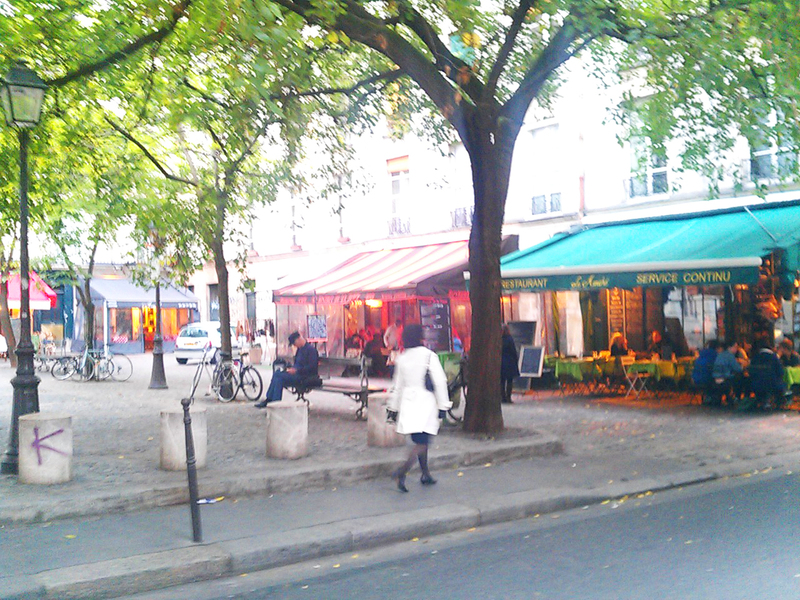 It is part of the Marais neighborhood, once a royal area full of palaces, which later became a Jewish neighborhood. This run will just give you a first glimpse of it all. 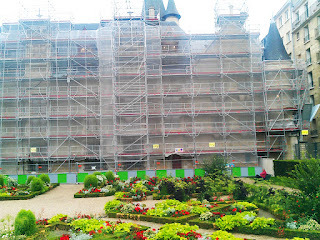 Immediately, on the right, you'll pass the Hôtel de Sens, a 500-year-old bishops' palace with its formal gardens. 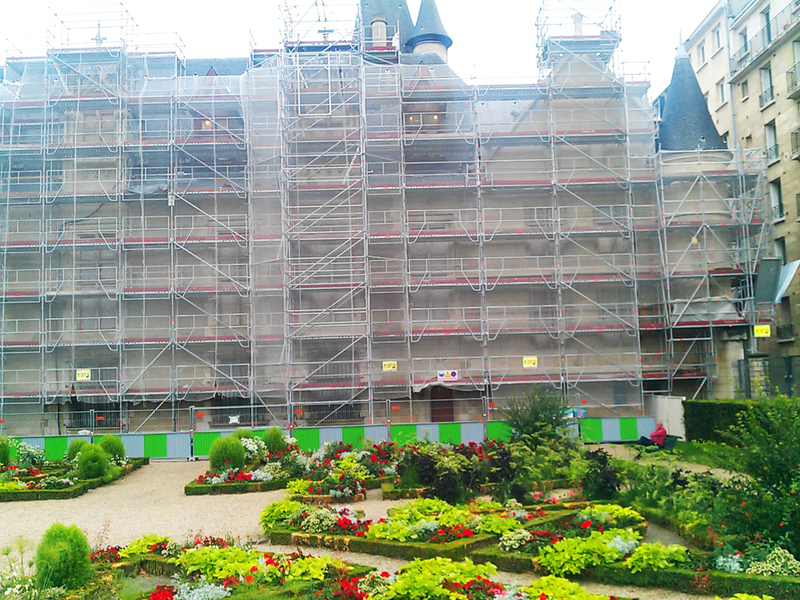 Unfortunately, the building was being restored when I last ran by. 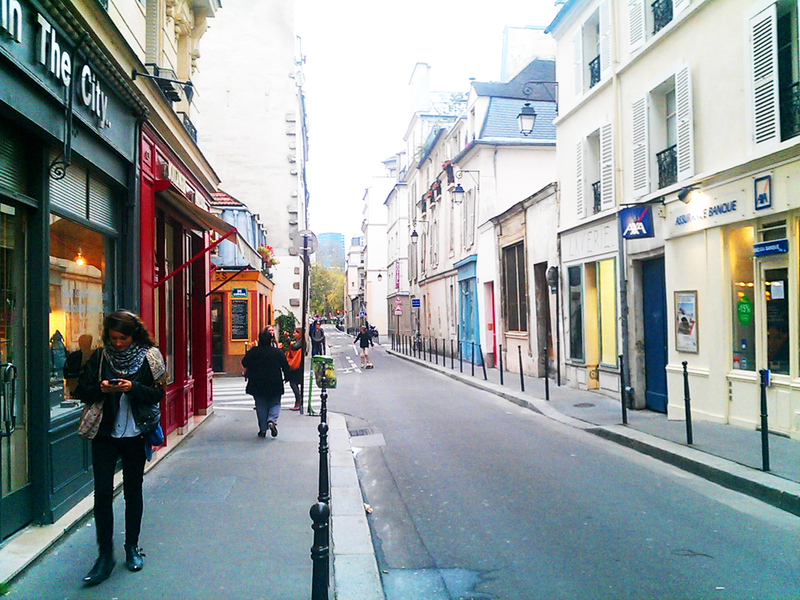 Run down Rue Fourcy until it ends at St. Paul's main street, Rivoli. Turn right there, where the street has a narrow square (Place St. Paul) full of bus stops, and run past the gigantic rococo church, St.Paul-St. Louis. Turn left right after the church, on Rue Caron, and run straight through the leafy little square, Place du Marché Sainte-Catherine (it takes longer to say its name than to run through it). The street ends at Rue de Jarente, where you turn right and run past a beautiful courtyard and an old public water source. 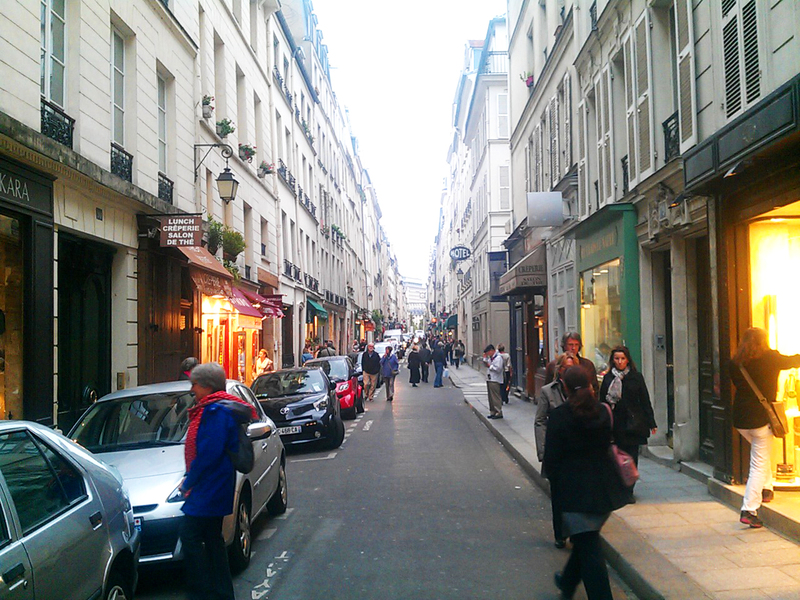 This short street then ends at Rue de Turenne, where you turn left. 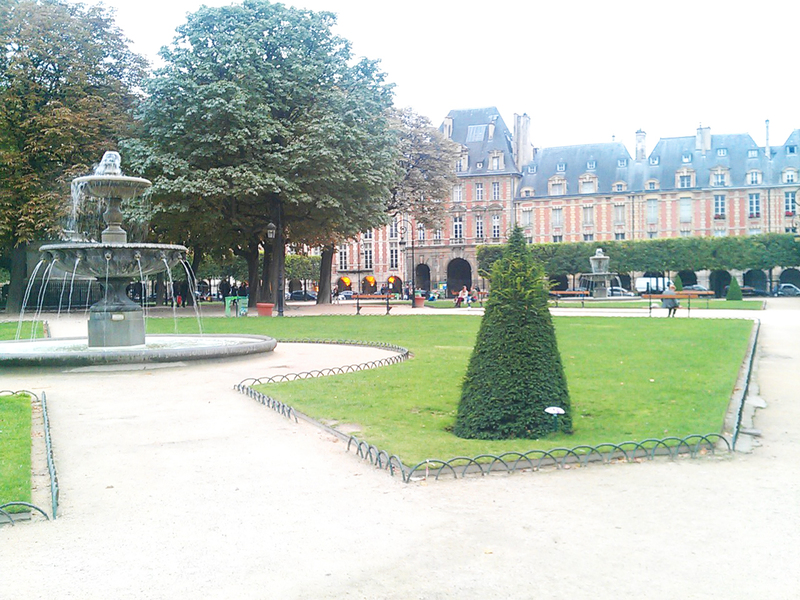 Just run to the end of the block to turn right and enter into the impressive Place des Vosges, at its northwest corner. The whole square was a royal parade grounds for the cavalry, surrounded by elegant townhouses. Place des Vosges: run through those arches on the far side! Run diagonally through the square, past the mounted statue of Henry IV to leave the square on the south side through the big archway. You are now on Rue de Birague, full of nice interior-decoration shops. This street ends after a block, where you come back to St. Paul's main street again, but the name has changed here from Rivoli to Rue St. Antoine. Turn left here to continue running eastwards, but only for a block. You will see the tall column of the Place de la Bastille straight ahead. But the traffic is terrible there, so we'll turn off at the next side street to avoid it. At the green neon pharmacy sign, turn right on Rue du Petit Musc, and run south towards the Seine on this old street. After four blocks, it ends at a little park at the Seine. Turn left here and cross busy Boulevard Henri IV to continue eastwards down Rull de Sully. This street curves to the left as it runs into Rue Mornay for the last two blocks before coming to the big boat harbor, Basin de l'Arsenal. This is the old harbor for the St. Martin canal that ends here. The old barges used to tie up at this spot, now it's used by weekend boaters. Turn right to run south along the basin, with the water to your left. 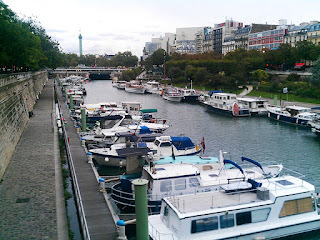 When you get to the end, turn left and cross the street (Pont Morland) to run by the Quai de la Rapèe Metro station located right on the Seine. Now cross the, loud, traffic-filled bridge over the river, the Pont d'Austerlitz, with the Austerlitz railway station across the river to the left. 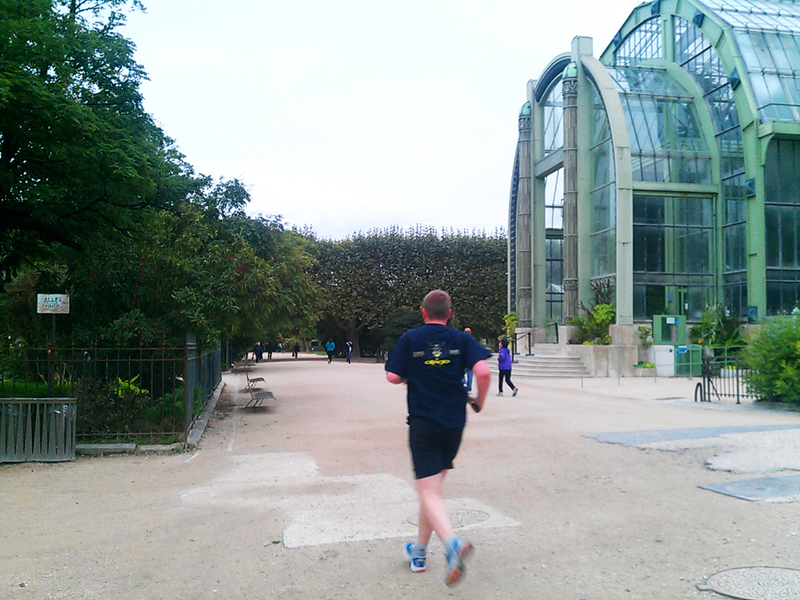 We are running to that green park on the right end of the bridge, the botanical garden, or the Jardin des Plantes. You'll have to cross the busy, riverside road at the far end of the bridge, Quai St. Bernard, and then go straight into the main park entrance. You'll see the big, palace-like Zoology building at the far end of the park. Now keep to the left and follow one of the paths along the left side (south) of the park, heading towards the west end of the park. You can either run up the open middle part with all the flower beds or keep further left on the wide, tree-lined path. You'll quickly notice that this is one of the most popular running routes in town: everybody seems to be running here. 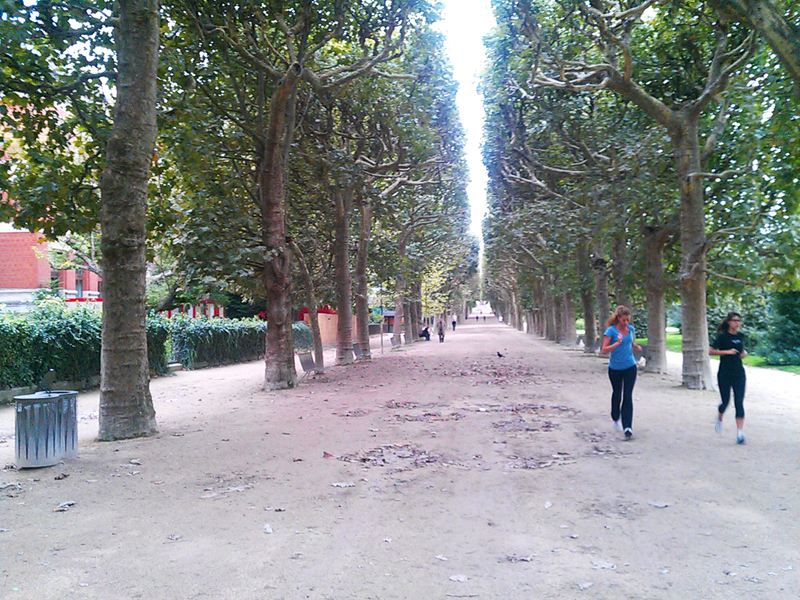 Well, that's not really true: most runners are out in the Bois de Bologne during nice weather. When you get to the massive Zoology building, turn right and run up the ramp between the two greenhouses. We'll now run a little loop through part of the zoo. Run straight past the stone building on the right, then turn right and run a circle around the wallaby lawn (small kangaroos). This part of the zoo is open to everyone. But that's all that you can see without buying a ticket, except for the deer on the other side of the path. Once you get back to the south side of the wallaby lawn turn left to run back into the botanical garden, with the big greenhouse on the right. More runners in the botanical garden. This is the place! Then turn left and head back out towards the main park entrance again. Run out the gate and cross the street and turn left to run along the Seine, heading west, next to Quai Saint-Bernard. You'll come to an outdoor sculpture garden next to the river, the Jardin Tino Rossi. Cross the garden to the right to run down to the footpath next to the river, so we can now follow the water, away from the traffic noise. Continue running westwards until you get to the first bridge, the Pont de Sully, where you turn right to cross the bridge back to the island of St. Louis. 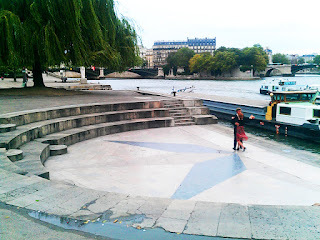 Dancing couple along the Seine, looking towards St. Louis. Hey, this is Paris! At the other side of the bridge, turn left to follow the St. Louis shoreline, heading west towards Notre Dame again. You'll pass another bridge, then the shore will curve to the right and come to the Pont St. Louis pedestrian bridge, where you earlier crossed from Citè to St. Louis. Turn left to cross it again, and now continue straight to run down Rue du Cloitre Notre Dame, along the north side of the cathedral. 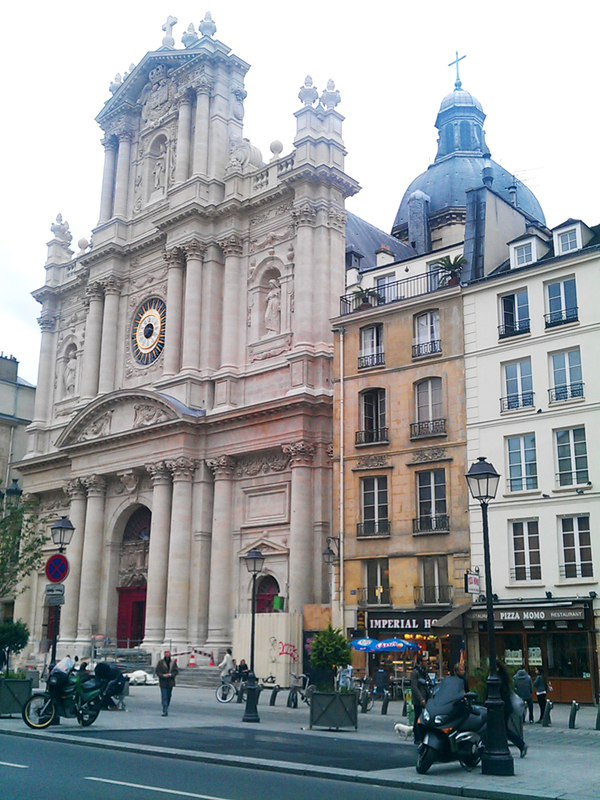 At the far end of the church you'll be back at Parvis Notre Dame square, where you started.